My original introduction to short form anime in the beginning of winter of 2013 was not that great. With the first couple of shows I watched I noticed I was having the same problems with each show. These problems included low animation quality, unfunny jokes, and a plot that seems to go nowhere. To say the least, my initial impression of short form anime was that no studio was going to invest the money to produce a quality product. Then I started to watch Encouragement Of Climb, and all my problems went away. Encouragement Of Climb (a.k.a. 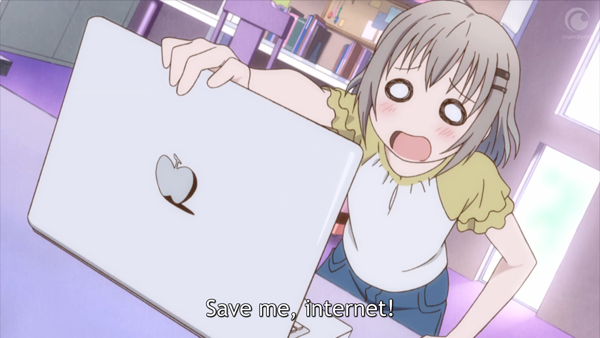 Yama no Susume) is a short form anime series about mountain climbing. 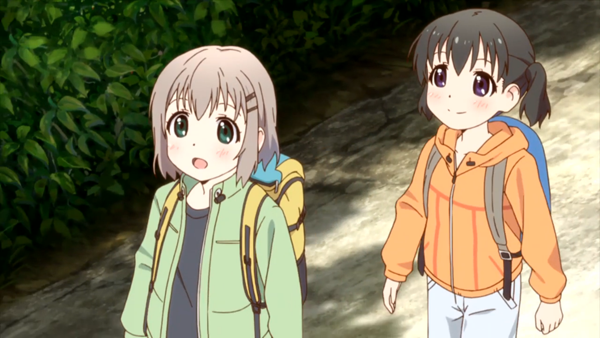 Aoi is a high school girl who used to love the mountains, but after a childhood accident she developed a fear of heights and now only engages in indoor activities that can be done by herself. As a result, she became so secluded from others that just the idea of hanging out with others made her nervous. That is until one day a classmate named Hinata approached her. 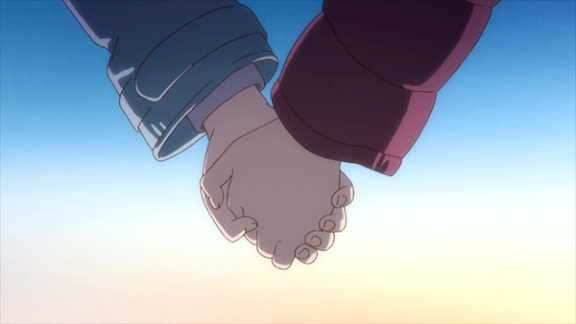 Hinata and Aoi used to be friends during elementary school and made a promise to each other to one day climb mountains together. 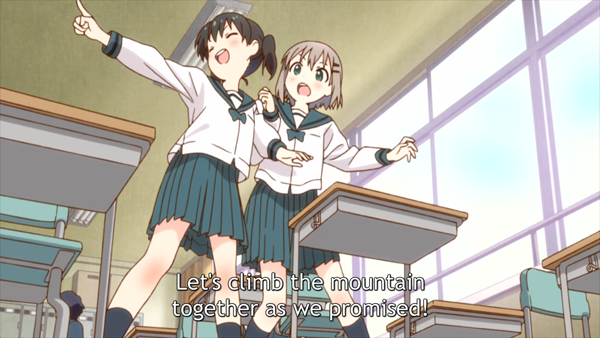 And since Hinata is such an extrovert she literally drags Aoi to her house so they one day climb mountains together. Encouragement Of Climb only has an episode length of three minutes and thirty seconds, but chose to not spend that time wasting the viewer's time. Each episode is completely dedicated to plot progression and character development. Amazingly, each episode contains a really well written short story that fits in well together to form a tight longer story that lasts about forty minutes. It was really refreshing to see a short show that tired to be more than the sum of its parts, story wise. It's funny that Encouragement Of Climb doesn't try to be an over-the-top comedy because I found the jokes in this show to be way funnier than both Ai-Mai-Mi and Ishida & Asakura. The humor is used sparingly and is based on the way actual people would react to certain situations (see image above). Aoi and Hinata have opposite personalities to each other, so the back and forth between them works really well without ever getting annoying. The format of Encouragement Of Climb is mainly one part story and one part mountain climbing lesson. The show is actually a really good beginners' guide to mountain climbing mainly because the educational parts fit seamlessly into the story and isn't the main reason for the show's existence. First and foremost, this show is about Hinata helping Aoi conquer her fear of heights and to help her make new friends along the way. The mountain climbing part helps craft the story in an interesting way and enhance the uniqueness of the show. The show has a really nice art direction as well. Everything has a soft look to it that is accentuated with brown outlines around the characters. The actual animation of the show is actually pretty fluid and looks like the show had some actual money put behind it. There are a few instances of the show using CGI shortcuts, but I found most of them to be unnoticeable on a first viewing. The only really obvious shortcut in animation takes place, oddly enough, during the first episode. The animation only improves from there. I loved watching Encouragement Of Climb. It's a perfect example of how to make a short anime series that's more than just a series of stupid jokes. It features a genuinely heartwarming story about facing your fears and getting out of your comfort zone. If you think all short form anime are low budget garbage, watch this show and learn how a short series can not only succeed, but also thrive. And thrive it did because the second season that recently started will feature twice as many episodes with each episode having three times the length. If that's not the sign of a successful show, I don't know what is. If you’re interested in watching Encouragement of Climb Season 2, you can officially watch the show on Crunchyroll.